Best Pair II is a port of Jim Burrows' BestPair DOS program for Macintosh and Windows computers. 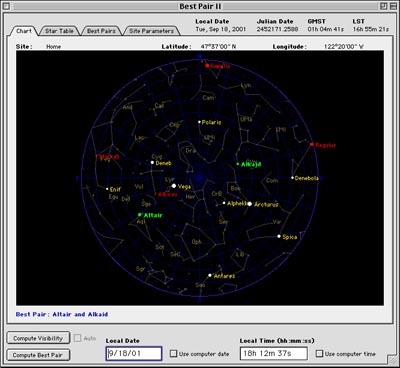 It is designed to select the "best" pair of alignment stars for performing a 2-star alignment of a Meade LX200 Classic telescope (or any Meade telescope that uses the AutoStar computer controller) in Alt-Azimuth mode. The application looks at the pointing errors involved with performing an alignment with each pair of Meade's choice of 33 stars (or 78 in the case of AutoStar), examining only those that will be visible at the place and time specified. The pair of stars chosen is that with the smallest error. Note: Best Pair II is now superceded by another application (AstroPlanner) that contains all the Best Pair functionality and a lot more (including NexStar support, telescope control, polar alignment, etc.) . It does, however, require more resources. If you have a slow computer with very limited RAM you might be happier with Best Pair II. No further development of the Best Pair application is expected. Like Best Pair, the basic version of AstroPlanner is free. Note: A minor bug in the original DOS application has been fixed in this product (Best Pair II), so the results you get might not be exactly the same as you would get with the original DOS version. Jim has updated his DOS version to fix this problem. Best Pair II is Freeware. Use it at your own risk. If you would like to support my astronomy obsess..., er hobby, and feel this application has some value to you, I always gratefully accept donations. Creating software like this requires lots of time and expensive software and equipment. Note: Although Best Pair II is freeware, please do not post the files anywhere else without permission. Feel free to point anybody at this page or publish the URL publicly. Q. Do I have to connect my computer to my telescope to use Best Pair II? A. (PR)No, Best Pair II works independently of the telescope. All it does is choose a pair of alignment stars that will, hopefully, minimise the pointing error if used correctly. Q. Will Best Pair always improve my pointing accuracy? A. (PR)Quite possibly, but only if you take care to make sure that your telescope is level and pointing in the right direction (South for LX200, North for AutoStar) before switching on and making sure that the alignment stars are properly centred in the eyepiece field (use a reticle eyepiece where possible). Q. I noticed one other thing about Best Pair II -- The best pair consists of stars that not only are far apart in azimuth, but also are not the same altitude. Is it common for one of them to be rather high (like 60 degrees) and the other appreciably lower? Sometimes Best Pair will choose a pair like Polaris and Mira - stars that are very close in RA. Is this OK? A. (JB) There's specific formulas using latitude and sidereal time to compute altaz from RA-dec and vice-versa. So altaz alignment doesn't care about RA-dec. Altaz alignment only has to find two encoder biases and two mount tilts. Best Pair evaluates the errors in those estimates for every possible pair, then selects the pair that minimizes the whole-sky pointing variance. Q. It would seem like the inaccuracy of centering a star would make the RA of Polaris quite inaccurate, though it would still be "well located" in Alt Az space. A. (JB)That's the reason, contrary to Meade's manual, that Polaris is a viable candidate for one of the best pair for altaz alignment. Q. What about Polar alignment? telescope has been aligned mechanically. (PR) AstroPlanner has some tools to help with polar alignment. Q. How can I get my laptop screen to turn red to save my night vision? Fixes a late-breaking bug where East and West was mixed up on the longitude setting. WARNING: please check your site longitude settings. They might need to be changed from W to E or vice versa. Added AutoStar capability (see Preferences) as an option. This lists the 79 AutoStar alignment stars. Whether this will be of use remains to be seen. Takes substantially longer to compute. Added optional rejection of stars of low magnitude. Added optional display of constellation figures and stars down to Magnitude 4.5. Added display of all pairings of stars (Best Pairs tab) that gives a list of the pairs in order of increasing error. Thus you can find the second best choice and see how much worse it is. Also shows separation of stars in degrees. Errors can be displayed in absolute as well as relative form, for those that want to do comparisons. Option in Preferences. Check boxes added to best-pair lines so that several pairs can be displayed simultaneously, or different pairs singly without having to recompute. A dotted line can be drawn between best-pairs. Option in Preferences. "Always Reject" stars for LX200 and AutoStar now kept separately. Various cosmetic and performance tweaks and some minor bug fixes. Fixes to handle European number/date format. This does not affect anyone using US or English number formats. Fix to handle fractional UTC offsets. This does not affect anyone with a UTC offset of a whole number of hours. Some very minor cosmetic tweaks. Unless you are affected by the above changes, there is no need to upgrade from V 1.2.